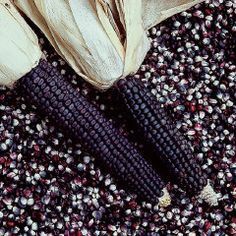 Zea mays is the quintessential Native American crop, corn was a staple of indigenous peoples from South America to the Great Lakes. 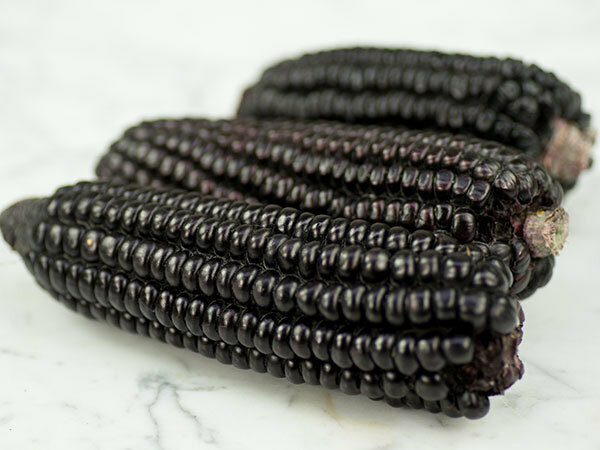 It’s believed to have been domesticated in Mexico, and may be of the world’s oldest agricultural crops. It’s best seeded directly into the garden, in good, rich, well-drained soil, right about the time of the last spring frost. Plant it in blocks rather than long narrow rows, to improve pollination. Corn can be very drought tolerant, but ears fill best when there is good soil moisture when tassels and silk first emerge. Dent corn has hard, "flinty" sides composed of horny starc, with soft starchy tops and cores that allow the ends to collapse or "dent" when the corn dries. Varieties of dent corn are the most widely grown types in the United States and used for oils, syrups, grits, meals, flours, bio-fuel, silage, and livestock feed. The plants have average about eight feet tall producing one to two ears per stalk. The ears are large with cobs that are generally white but can throw an occasional reddish tinted one. It is a good roasting corn, and when picked in the early milk stage about 80 to 85 days. Also good for frying or as some people call it creaming. Bloody Butcher is an old dent-type corn has been grown in the United States since at least 1845. The stalks reach ten to twelve feet tall with two to six ears of corn per stalk. 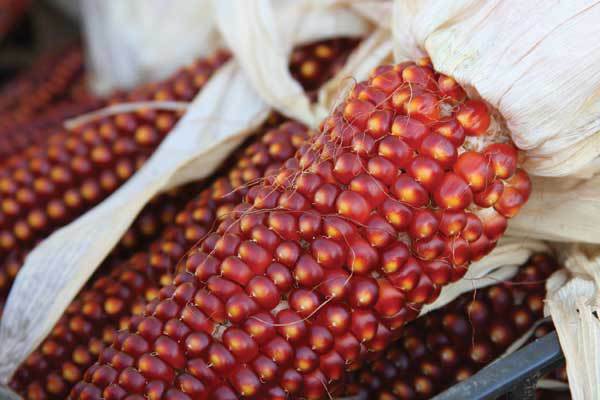 The kernels are striped red or dark red on pink to red cobs. Can be used for roasting or frying when young but generally used for flour or corn meal. Good flavored. 120 days. As its names suggests, these large ears have kernels that are colored mostly in shades of green. Fairly early maturing for a dent-type corn and has good vigor. The corn stocks reach about seven feet in height and produce ears ranging between seven to ten inches in length. 95 days. Flint corn typically has hard seed coats that with rounded, smooth, kernels consisting of soft starch covered by horny starch. Many “Indian” corn types are flint type. The are well suited for making good quality corn meal or ground and used for livestock feed. 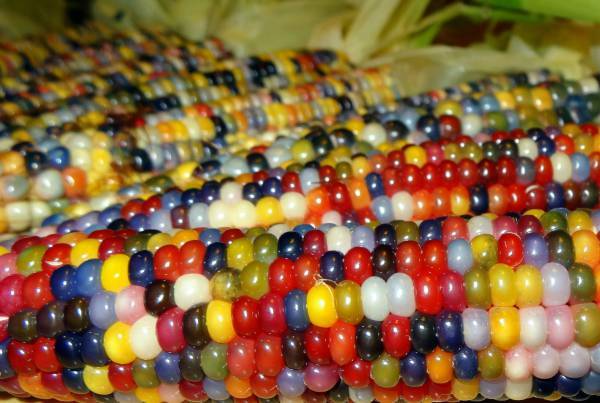 An amazingly beautiful, translucent, multicolored corn. Although the photos that went viral on the internet were awesome, they did not do justice to actually seeing an ear in my own hand. 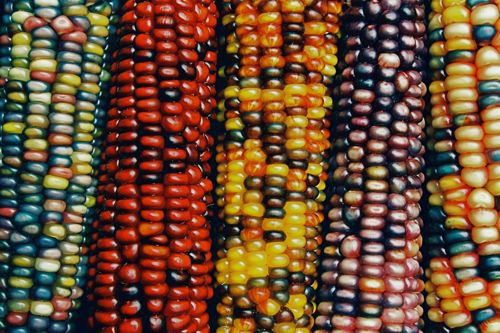 The colors displayed are rare in the plant world, let alone all contained within one ear of corn. As a result of its complex parentage, 'Glass Gem' has a very diverse genetic makeup. 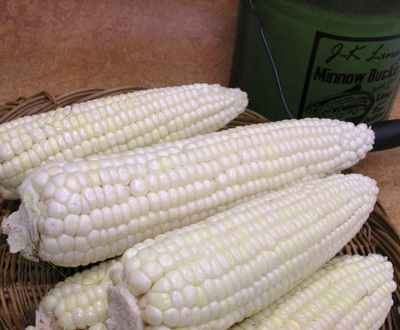 Along with its color variations, it exhibits a spectrum of flint and popping corn characteristics. Although folks are primarily growing it for the unique ornamental value, it can be popped or it can be ground into cornmeal or flour. 105 days. This open-pollinated flour variety has great colors for drying and for using as an ornamental. Ears range from seven to nine inches. Although it can be used as roasting or frying ears when young, it is generally used for flour and meal, or as mentioned above, as an ornamental variety for decorations. 110 days. 'Floriani Red Flint' was named by William Rubel after his Italian friends who grow it and generously shared their seeds. Adapted over the centuries, through selection, by the Alpine farmers who ate it themselves, it became the staple polenta corn of the people living in the Valsugana Valley near the city of Trento, in Italy. The stalks are sturdy and reach ten feet in height. 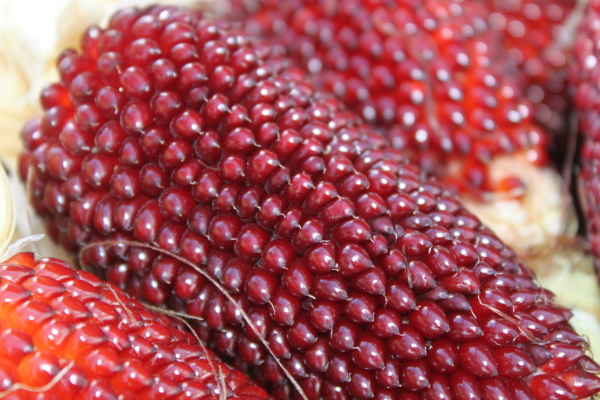 The ears are six to seven inches long with twelve to sixteen rows of medium to deep-red colored kernels that are lightly yellow-tipped and slightly pointed. 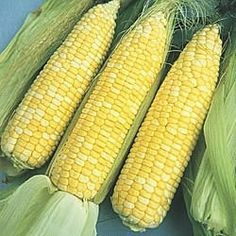 It is a very versatile and tasty corn. 95 to 100 days. Popcorn is one of the oldest forms of corn and can be generally classified into two types, pearl or rice, based on the physical shape of the kernels. Popcorn usually has small kernels that contain a high percentage of horny starch - even more than flint-types. This causes them to violently burst and expand upon heating. 'A very old variety of pop corn that has not lost its appeal to home gardeners. It is quite dwarf in habit with plants only reaching about five feet in height. Each stalk produces two to three ears that are short and thick, about four inches in length and two inches in diameter. 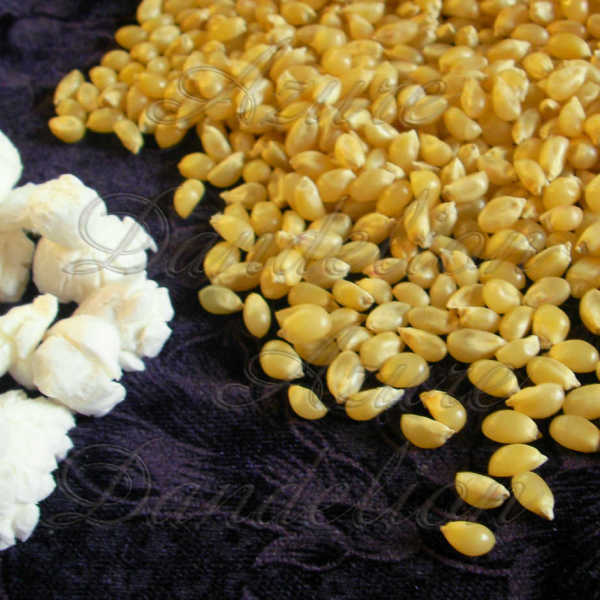 Kernels are arranged irregularly on cob and are unusually tender, sweet, and pure white when popped. 85 days. 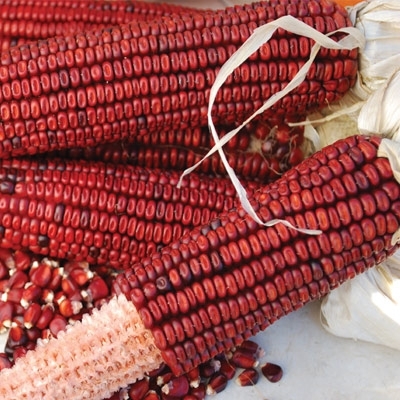 Popular for drying, the cobs are strawberry shaped and rich, deep-red color. The four foot tall plants are highly ornamental and an excellent choice for an edible landscape planting. 105 days. 'Colors can include red, yellow, black, gray, brown, purple, pink, blue, white and orange. A small percentage of ears will be solid colored but most are combinations of many colors and even "calicos." 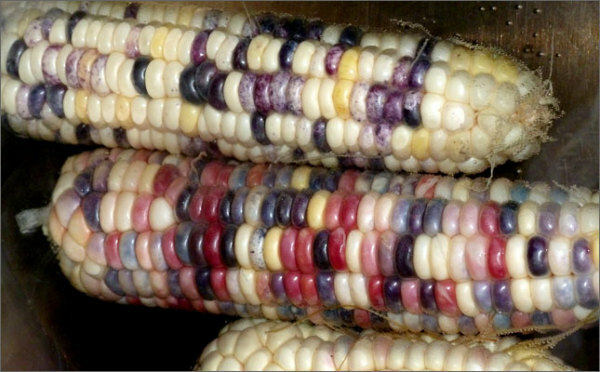 Some ears also have red, purple, or brown husks and cobs. Very ornamental yet very tasty. Stalks grow to about six feet in height and produces two to three ears each. The ears are small, narrow and average three to five inches in length. The kernels are shiny, often pearly in appearance, bright, and varying in color. 105 days . 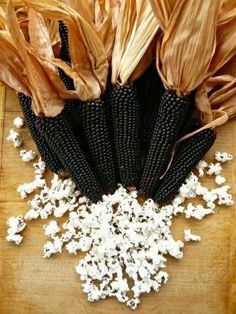 Dark reddish-black ears of corn are quite attractive for fall decorations, or popping into tasty popcorn! This variety is easy to grow, and does well in almost all growing climates. Fun for children’s gardens. Sweet corn is the result of a natural spontaneous mutation of field corn that occurred sometime before recorded history. Predating the arrival of Europeans in North America, it was cultivated by several Native American tribes. A variety named 'Papoon' was raised by the Iroquois, and subsequently by settlers, by 1779. Two of the oldest surviving white sweet varieties are 'Stowell's Evergreen' and 'Country Gentleman.' The yellow sweet corn Golden Bantam was released in 1902 and has been popular ever since. Sweet corn is now primarily grown for fresh, canned and frozen consumption and not used for flour or feed. Its genetic makeup is such that it accumulates sugars while the kernels are immature. 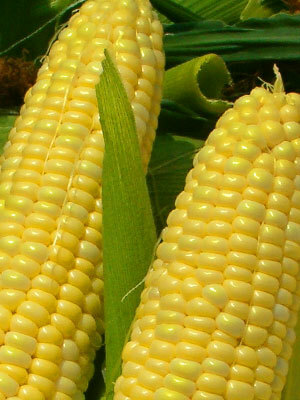 The plants are short and produce two small, five to six inch ears that have eight to ten rows of sweet, yellow kernels. The flavor is delicious - tender, not starchy, flavorful and just the right amount of sweet. The plants commonly produce side shoots that provide additional, although usually smaller ears. Because 'Orchard Baby' corn is physically compact in size, it is an ideal candidate for folks who want to experiment with, or just have some fun, growing corn in containers. It is also an perfect choice for folks with small vegetable gardens and those who live in areas that have short growing seasons. 65 days. This has been a home garden and market favorite white variety since Nathan Stowell of New Jersey introduced it in 1848. It is a late season variety, yields eight inch ears that produce anywhere from fourteen to eighteen rows of sweet, white, tender kernels. Keeps longer than most which makes it one of the best heirloom varieties for table, canning and freezing. 95 days. This is a very interesting open-pollinated, sweet corn variety developed for cooler and shorter growing seasons. 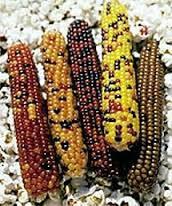 Each ear is about seven inches in length and filled with multicolored, flavorful kernels on stalks that are five to six feet in height. 75 days. This very old heirloom variety produces seven inch ears on approximately six foot tall plants. 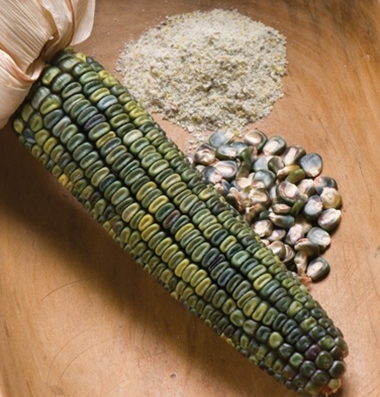 When the kernels are still light colored, the ears can be picked and used as sweet corn. Allowing the ears to mature, the kernels turn black, gray-black, or bluish-black in color. 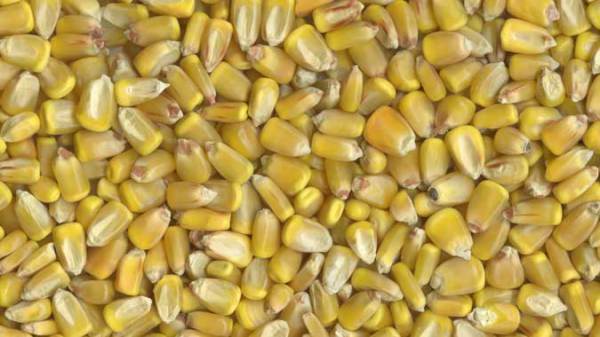 Harvested at that mature stage, it can be dried and ground for corn meal. 85 days.